湖泊科学 2016, Vol. 28 Issue (1): 75-85. DOI: 10.18307/2016.0109. 邓伟明, 徐晓梅, 陈春瑜, 何佳, 许迪, 王丽, 滇池表层沉积物铵态氮吸附特征. 湖泊科学, 2016, 28(1): 75-85. DOI: 10.18307/2016.0109. DENG Weiming, XU Xiaomei, CHEN Chunyu, HE Jia, XU Di, WANG Li. Sorption and desorption characteristics of ammonium in the surface sediments of Lake Dianchi. Journal of Lake Sciences, 2016, 28(1): 75-85. DOI: 10.18307/2016.0109. 作者简介：邓伟明(1984~), 男, 硕士, 助理工程师; E-mail:ming_605@163.com. 摘要：为研究滇池内源污染特征, 2013年利用GIS软件针对滇池全湖布设36个采样点, 采集表层沉积物, 研究滇池表层沉积物铵态氮(NH4+-N)吸附特征, 同时分析沉积物的理化性质对NH4+-N吸附特性的影响.结果表明:滇池表层沉积物对NH4+-N的吸附量在前2 h之内呈增长趋势, 吸附速率较大, 之后沉积物对NH4+-N的吸附量不随时间变化而变化, 基本达到平衡, 最大吸附速率均发生在0~5 min内; 不同区域表层沉积物NH4+-N最大吸附速率平均值表现为:外海南部>湖心区>外海北部>草海, 最大吸附量平均值表现为:湖心区>外海南部>外海北部>草海, 吸附效率平均值表现为:外海北部>草海>湖心区>外海南部; 沉积物对NH4+-N的吸附量与NH4+-N的初始浓度大致呈线性关系, 并且低浓度下表现出很好的吸附/解吸特征; 滇池表层沉积物NH4+-N的吸附解吸平衡浓度(ENC0)高于上覆水中NH4+-N浓度, 表明沉积物中NH4+-N有向上覆水中释放的风险, 沉积物在很长一段时间内起到水体污染"源"的作用; ENC0与沉积物中总氮、NH4+-N含量呈显著正相关, 本底吸附量和有机质总量呈显著负相关, 沉积物吸附NH4+-N主要受有机质的影响. Abstract: In order to study the endogenous pollution characteristics of Lake Dianchi, 36 samples were set in whole Lake Dianchi using the GIS exploring in 2013. Through collecting the surface sediment samples, adsorption characteristics of ammonia on surface sediments were studied and the influence of physical and chemical properties of sediments on the adsorption characteristics of ammonia was also analyzed. 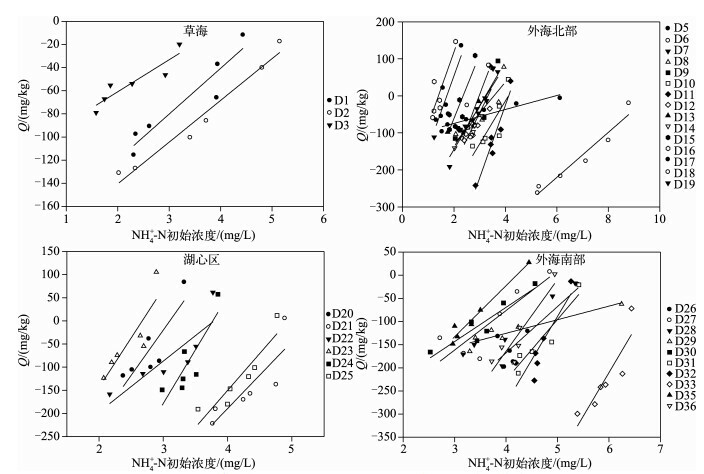 The results showed that the adsorption quantity of ammonia nitrogen on surface sediments of the Lake Dianchi showed a growing trend in 2 h and the adsorption rate was relatively high. After 2 h, the adsorption quantity of ammonia on surface sediments did not change with time and attain the basic balance. 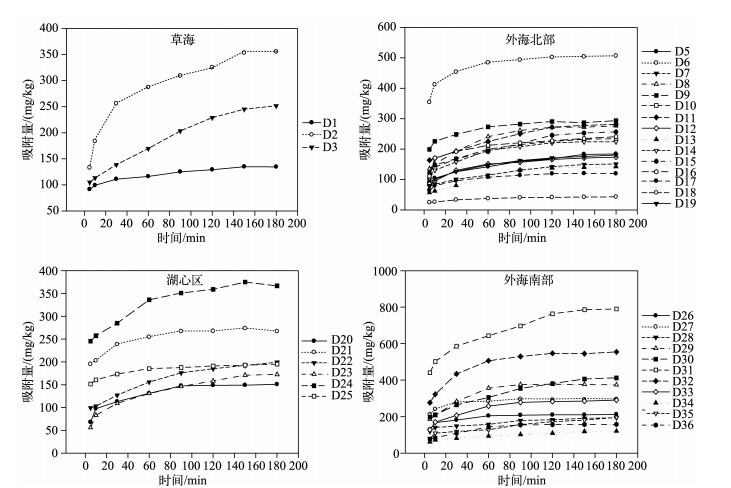 The maximum adsorption rate appeared during 0-5 min. 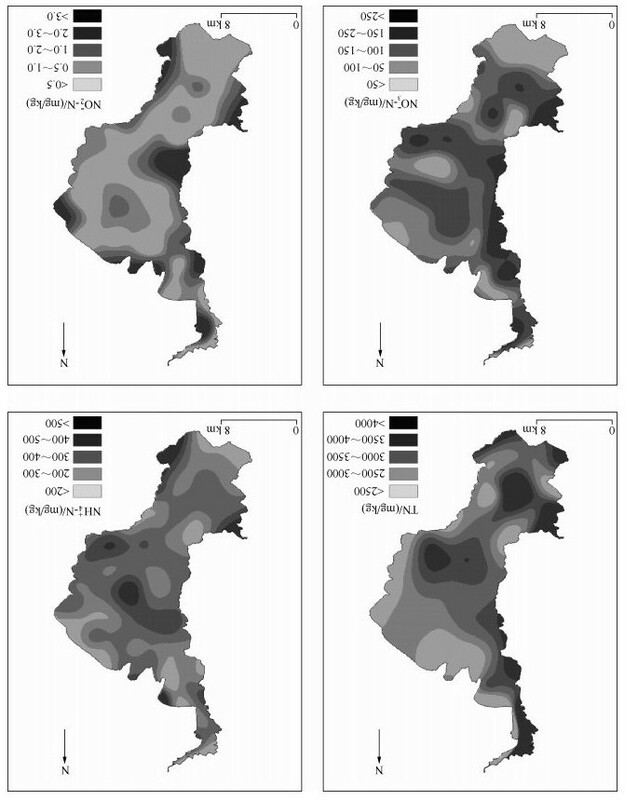 An order of the average maximum adsorption rate of ammonia on sediments of different sub-lake waters was:the south of Lake Waihai>the center of the lake>the south of Lake Waihai>Lake Caohai. 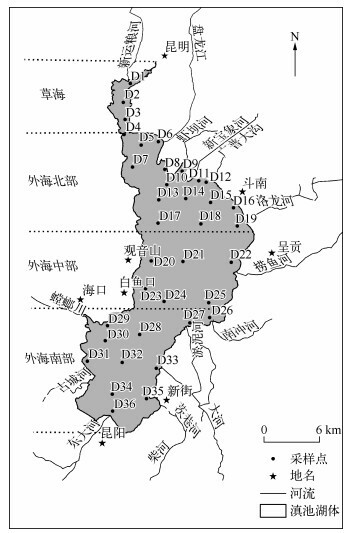 An order of the average of maximum adsorbent quantity was:the center of the lake>the south of Lake Waihai>the north of Lake Waihai>Lake Caohai. 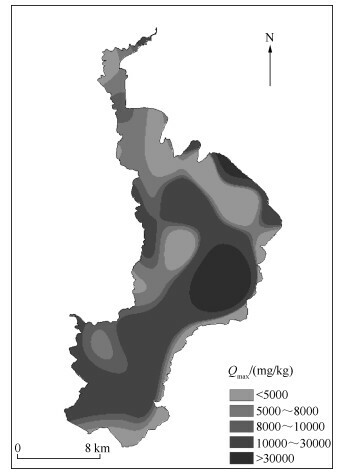 A order of the average adsorption efficiency was:the north of Lake Waihai>Lake Caohai>the center of the lake>the south of Lake Waihai. The adsorption quantity of ammonia on sediments showed a rough linear relationship with the initial concentration of ammonia. Under a low concentration condition, a good adsorption/desorption characteristic occurred. 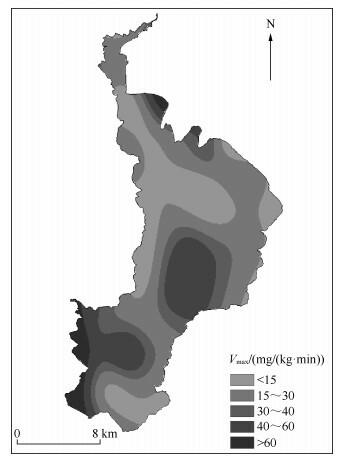 Through comparing the concentration of adsorption/desorption of ammonia on sediments and the concentration between overlying water and sediments, the results showed that the ENC0 of ammonia in sediments was higher than that in overlying water, indicating that the ammonia had the releasing risk from sediments to overlying water. These inferred that the sediments would play a role of the water pollution "source" in a long time. 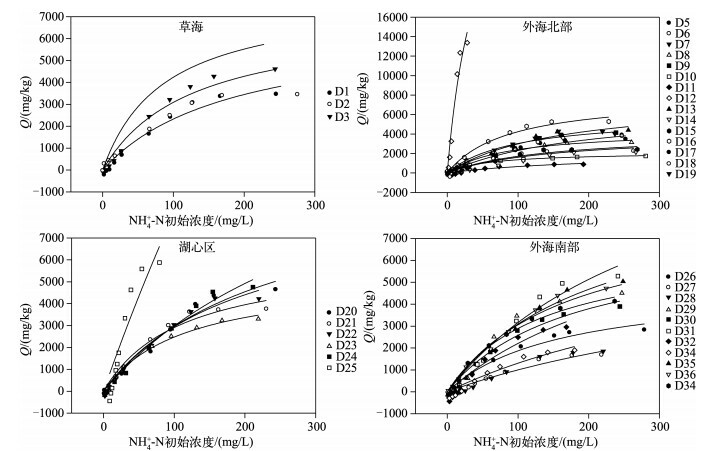 As ENC0 had the positive correlation with total nitrogen and ammonium nitrogen in sediments and NAN had negative correlation with total organic matter, we recognized that the ammonia adsorbed by sediments was mainly influenced by organic matter. Aller RC, Mckin JE, Ullman WJ et al. Early chemical diagenesis, sediment-water solute exchange, and storage of reactive organic matter near the mouth of the Changjiang, East China Sea. Continental Shelf Research, 1985, 4(1/2): 227-251. 王而力, 王雅迪, 王嗣淇. 西辽河不同粒级沉积物的氨氮吸附-解吸特征. 环境科学研究, 2012, 25(9): 1016-1023. 王娟, 王圣瑞, 金相灿等. 长江中下游浅水湖泊表层沉积物对氨氮的吸附特征. 农业环境科学学报, 2007, 26(4): 1224-1229. 杨一光, 杨桂华. 滇池自然地理概要. 云南大学学报:自然科学版, 1985, 7(增刊): 1-8. 齐素华, 艾萍, 王趁义. 滇池的富营养化现状分析及防治对策. 江苏环境科技, 2000, 13(4): 27. 鲍士旦. 土壤农化分析. 第3版. 北京: 中国农业出版社, 2000. 王娟. 浅水湖泊中氮素分布特征与沉积物氨氮吸附释放机理研究[学位论文]. 北京: 中国矿业大学, 2007. 王圣瑞, 何宗健等. 洱海表层沉积物中总氮含量及氨氮的释放特征. 环境科学研究, 2013, 26(3): 256-261. 胡智瞍, 孙红文, 潭媛. 湖泊沉积物对N和P的吸附特性及影响因素研究. 农业环境科学学报, 2004, 23(6): 1212-1216. 姜霞, 王秋娟, 王书航等. 太湖沉积物氮磷吸附/解吸特征分析. 环境科学, 2011, 32(5): 1285-1291. Swift RS. The effect of adsorbed organic materials on the cation exchange of clay minerals.In:Banin A, Kafkafi U eds. Agrochemicals in soils, 1980, 123-129. Padmesha TVN, Vijayaraghavana K, Sekaranb G et al. Batch and column studies on biosorption of acid dyes on fresh water macro alga Azolla filiculoides. Journal of Hazardous Materials, 2005, 125(1/2/3): 121-l29. 王圣瑞, 金相灿, 赵海朝等. 长江中下游浅水湖泊沉积物对磷的吸附特征. 环境科学, 2005, 26(3): 38-43. Jin X, Wang S, Pang Y et al. The adsorption of phosphate on different trophic lake sediments. Colloids and Surfaces A:Physicochemical & Engineering Aspects, 2005, 254: 241-248. 翟丽华, 刘鸿亮, 席北斗. 农业源头沟渠沉积物氮磷吸附特性研究. 农业环境科学学报, 2008, 27(4): 1359-1363. 杨洪美. 南四湖表层沉积物中氮形态及吸附释放研究[学位论文]. 北京: 中国矿业大学, 2007. 金相灿, 刘鸿亮, 屠清瑛等. 中国湖泊富营养化. 北京: 中国环境科学出版社, 1990, 121-133. 王圣瑞. 湖泊沉积物-水界面过程. 北京: 科学出版社, 2012. 姜桂华. 铵态氮在土壤中吸附性能探讨. 长安大学学报, 2004, 21(2): 32-38. 陈永川, 汤利, 张德刚等. 滇池水体叶绿素a的时空变化及磷对藻类生长的影响. 农业环境科学学报, 2008, 27(4): 555-560.